We always knew it was going to be something special. We even told you so. But little did we realise that Global Warfare III would exceed all expectations and raise the bar so very high for future drift competitions. I mean, how on earth is anyone supposed to follow on from that? 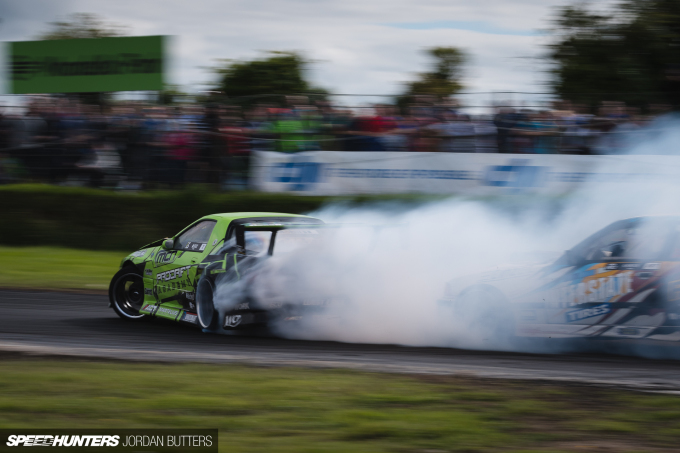 It’s no secret that Ireland is responsible for some of the most talented drifters on the planet. You only have to scan through the rosters from the world’s top drift series over the past 10 years to notice that a disproportionally high numbers of pro-level drivers hail from this small island at the edge of Europe; there’s a handful of current and former Irish Formula D stars. Closer to home, James Deane has retained the European Drift Allstars title for the past two years and leads this year’s standings. 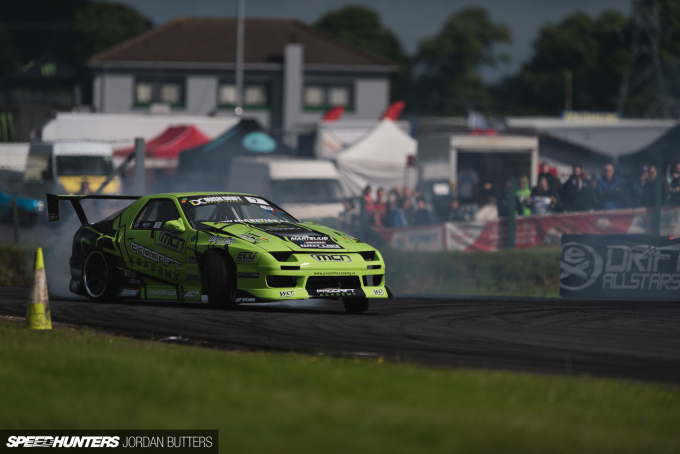 Fellow Irishman Jack Shanahan, at the age of 16, is the reigning British Drift Champion and leads the way this year too. 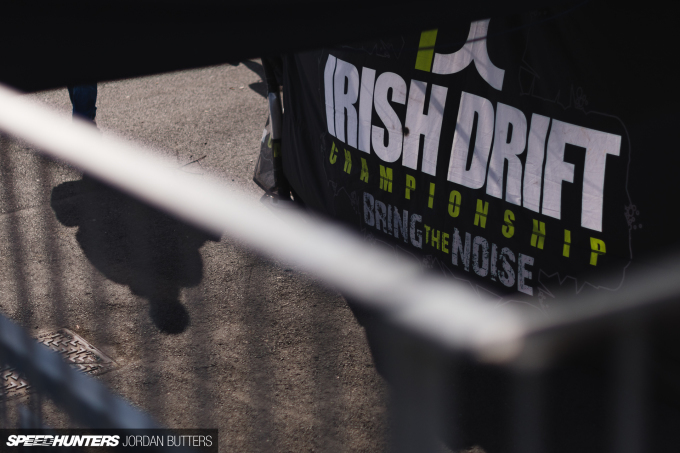 But the most poignant statistic of all, and one that visitors simply cannot shake from their minds is that, when it comes to the Irish Drift Championship, no foreign driver has beaten the Irish outright on Irish soil for over 12 years. 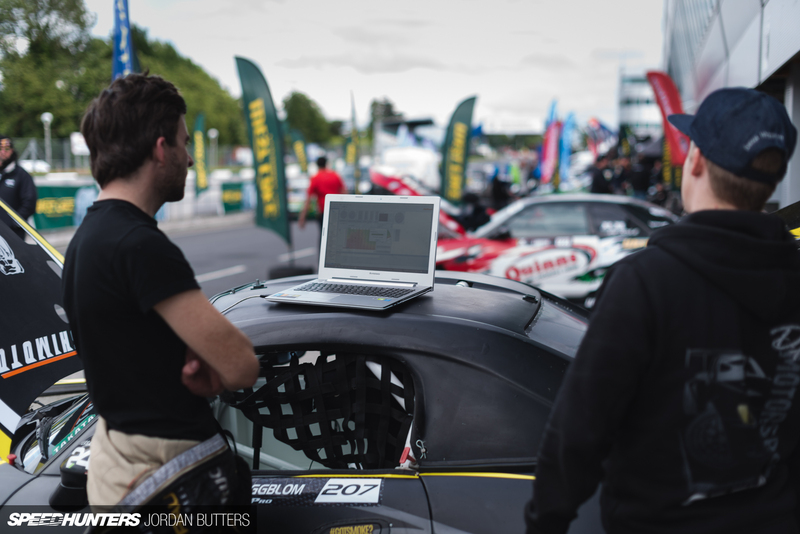 And it’s not like they haven’t made a concerted effort; alongside the have-a-go-heroes that make the journey over to the IDC throughout the year, the championship has flown in all manner of top level talent from around the world to challenge the crown. And each and every one of them has been sent packing. 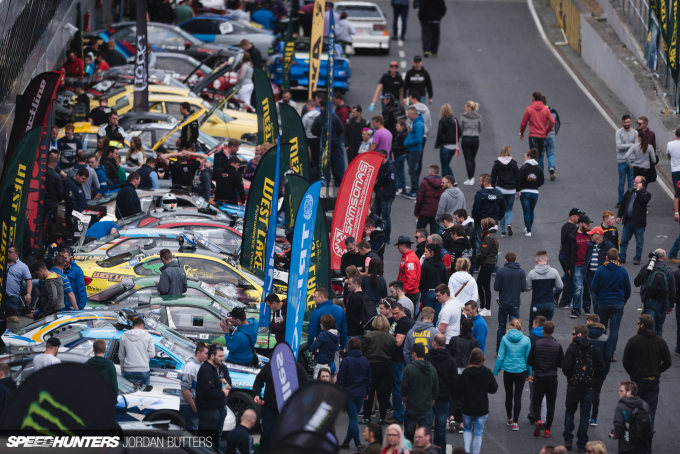 The naysayers might pipe up and point out that the visitors are almost always in borrowed cars, or that the judging panel is always entirely Irish, so it isn’t a fair fight. But not this time. This time it was different, and the Irish knew they had a fight on their hands. 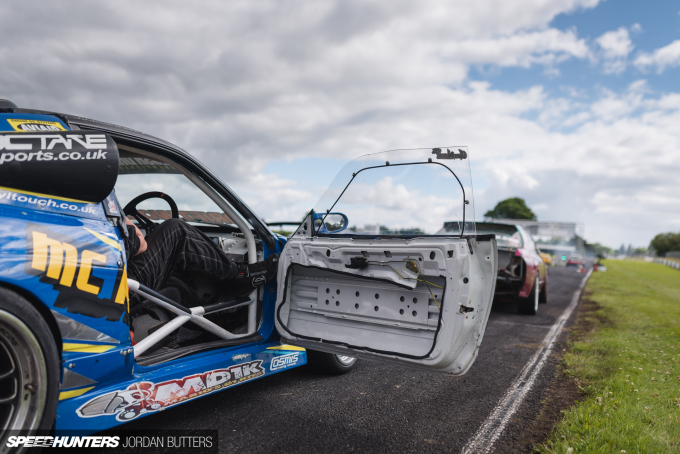 With 50 of the best drivers from all corners of the globe, all in their own vehicles, arriving at Mondello Park, and a panel comprised of both international and Irish judges, Global Warfare III would see the Drift Allstars series launch the biggest offensive against the Irish Drift Championship that had ever been attempted. 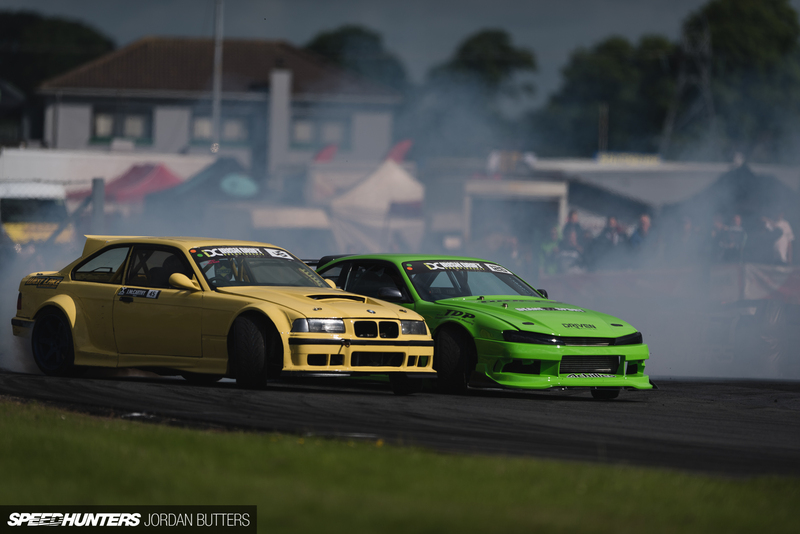 If you were lucky enough to be at Mondello Park on Sunday, or watching on the livestream around the world, then I’m sure you’ll agree that I’m not being unduly hyperbolic when I say that Global Warfare III was the best drift event that Europe, or possibly the world, has ever seen. John McCarthy and Tomas Kiely warm up their tandem skills during practice. 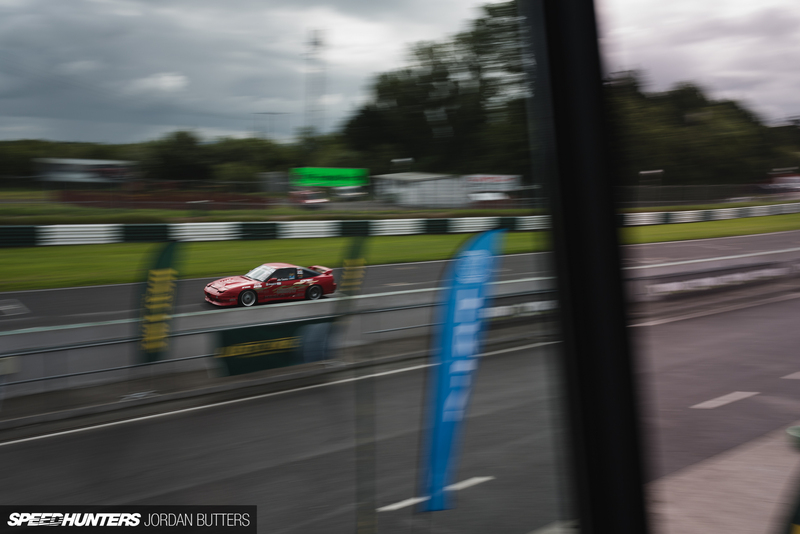 The Irish drivers have driven countless times together on track, and it quickly became clear to an outsider such as myself that tandem proximity wasn’t going to be an issue for the home side. 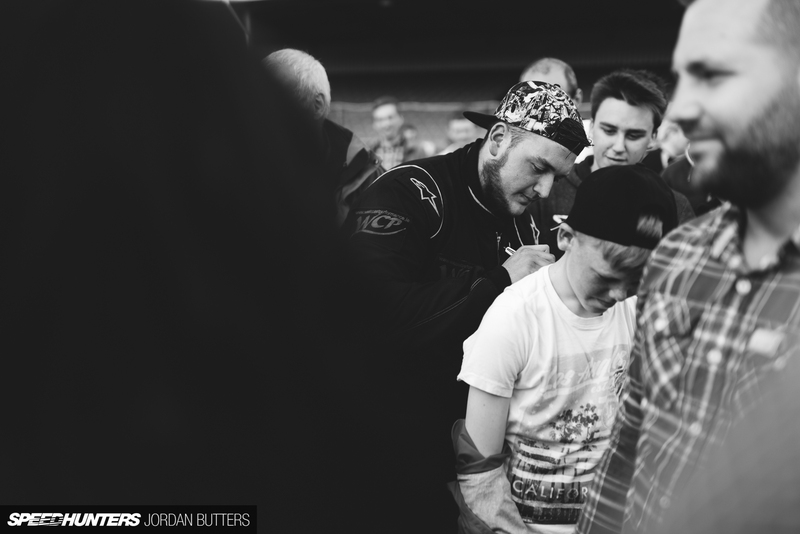 Before the event many had their money on James Deane as the overall winner. 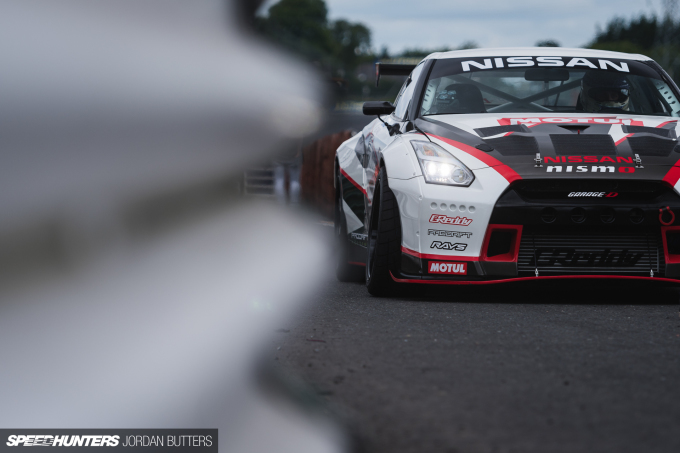 James is incredibly consistent and composed behind the wheel, and he’s near unbeatable at Mondello Park. Ultimately, though, he was beaten. It wouldn’t be Ireland without the rain, would it? 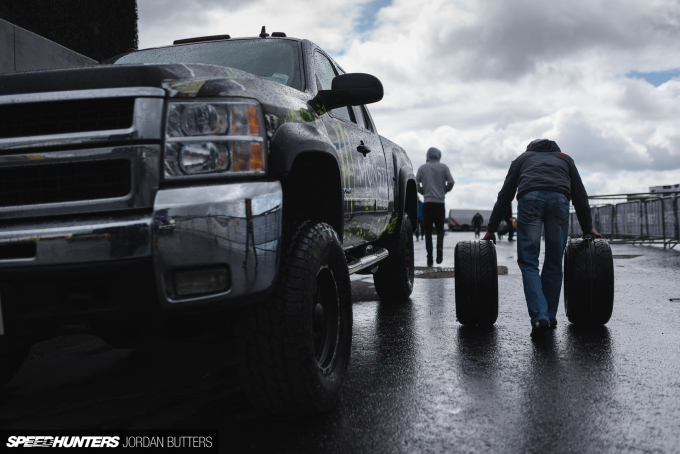 The changeable conditions during Saturday’s practice really threw some of the visiting drivers off their game. 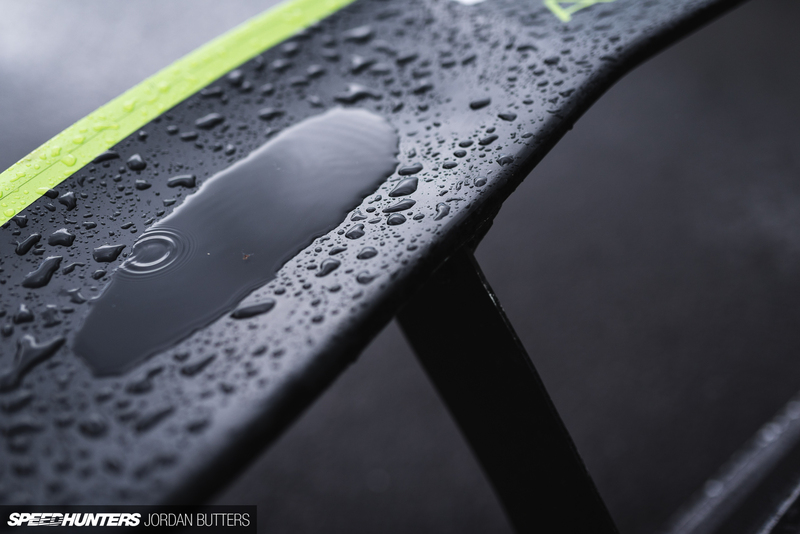 Dany Neville, who made the journey over from Dubai, had reportedly never driven in the rain before. Ever. The IDC has had international driver appearances at Global Warfare year after year, but this year it was clear that the visitors were here to do more than just appear – they were here to win. 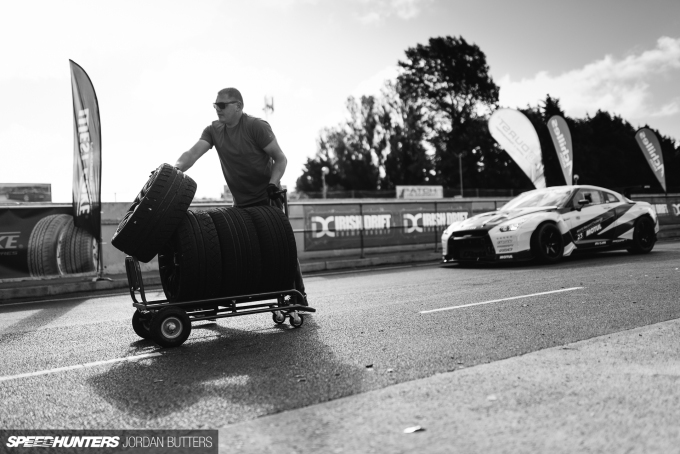 Budmat Auto brought with them a huge race rig, support team and two competition cars as well as a literal truck load of spares. 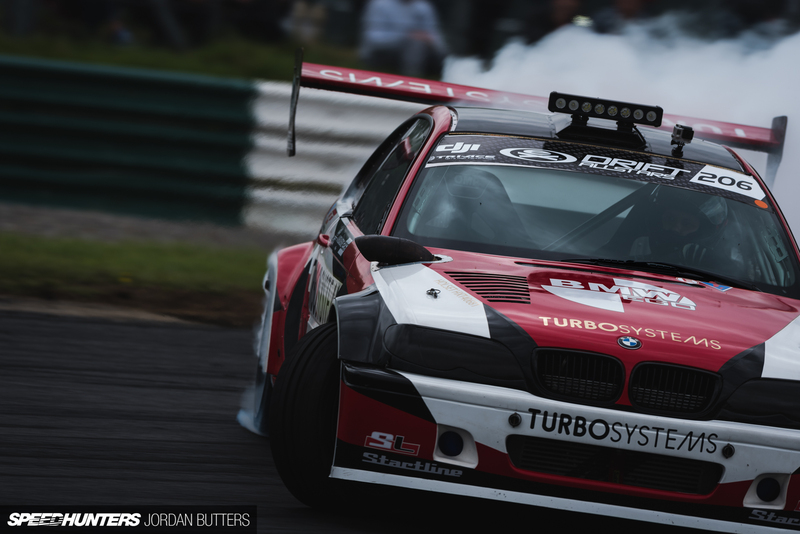 Piotr Wieçek chose to use the S14 for competition during the weekend. During qualifying the local drivers that had completed their runs gathered on the outside of the first corner to size up the competition. 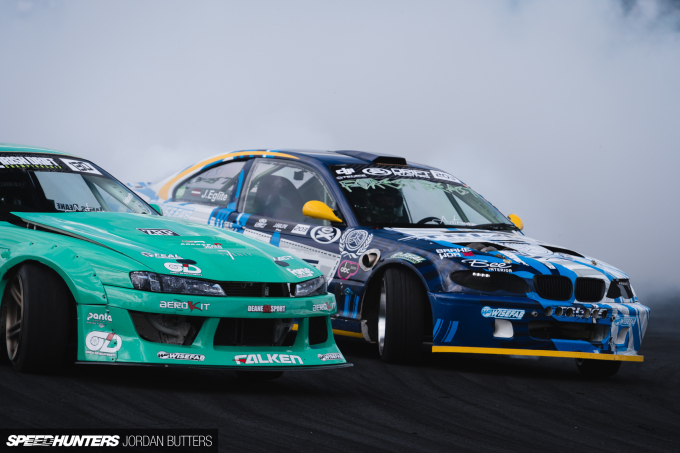 They’re all used to competing alongside each other, but this would be the first time that many of them had seen the Drift Allstars drivers in action. In the foreground German driver Max Heidrich flies past clip two in a blur. Final preparations are made before the battles begin. 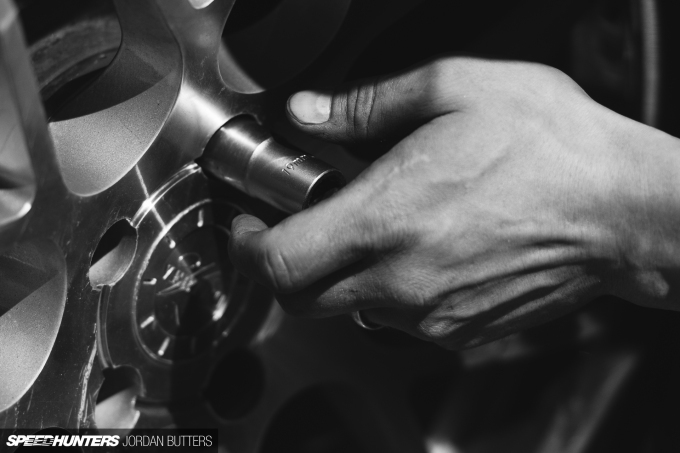 I often get strange looks when I’m perched by a car waiting for someone to tighten a bolt or attach a bumper. 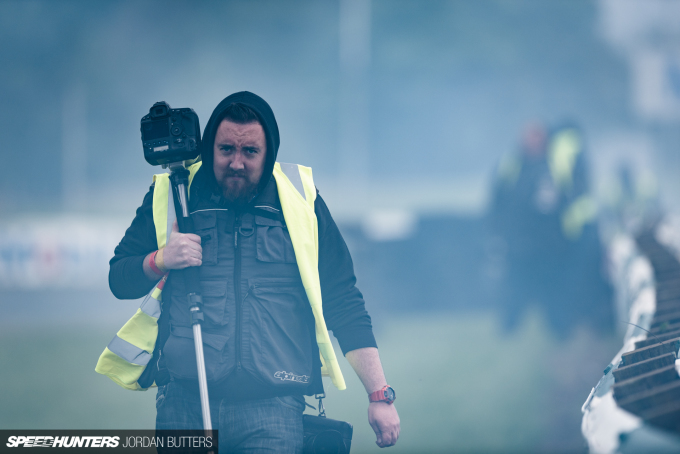 I guess with all the explosive action on circuit people wonder why I’d bother shooting something so apparently mundane, but I feel detail shots like this help tell the complete story of an event. 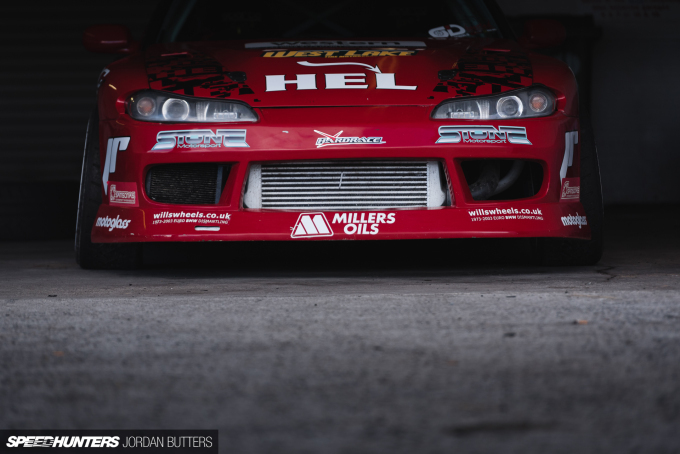 Norwegian Fredrik Øksnevad drove some 2000km and took three ferries over 46 hours in travelling to Global Warfare, including stopping off in the south of England to be reunited with his supercharged LS3 SPY+ Toyota Soarer after it returned from the Middle East too. What’s more, he made the trip entirely solo! Despite this, FredOx was stoked and ready to do battle against the Irish. 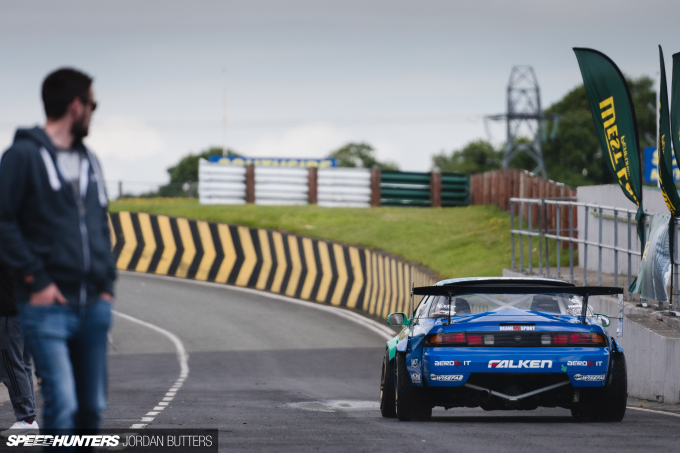 Hailing from England, former Team Falken driver Matt Carter’s pilgrimage to the home of Irish drifting was somewhat shorter than most. 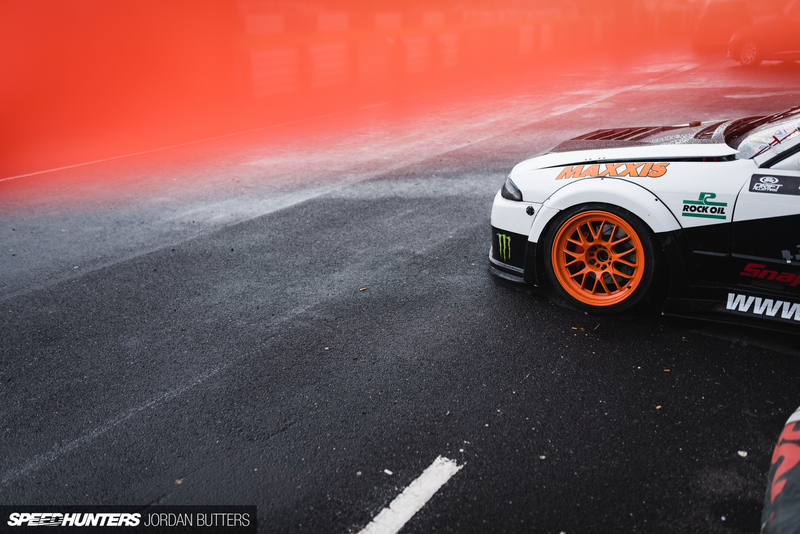 Matt’s R32 now sports the Team Japspeed livery and the familiar orange branding of Maxxis Tyres. I poked my head into IDC driver Kieran Stack’s pit garage on the Friday before practice to see that some pretty major surgery was taking place following a headgasket failure on his SR20. They rebuilt the engine overnight in the pit garage and you could hear the cheer from the other side of the paddock when it finally fired up again just before qualifying. 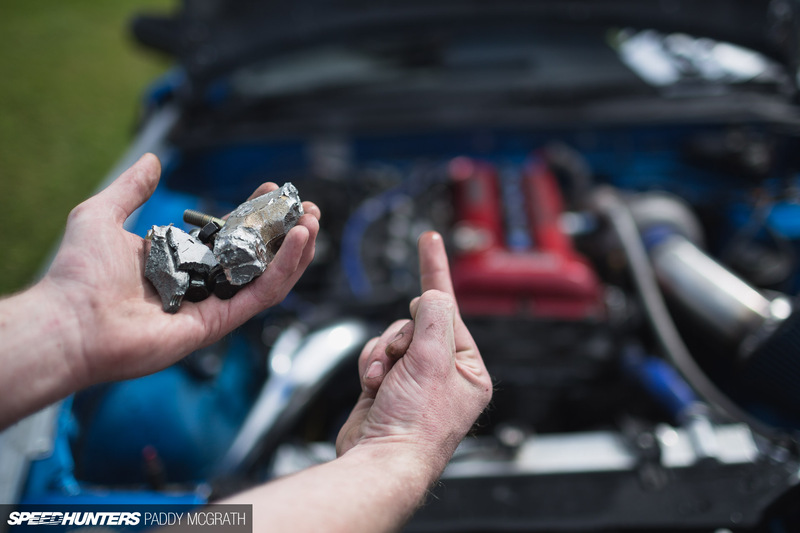 But sadly, the engine completely let go during his judged runs. Paul Conlan was laying down some incredibly dense smokescreens in his 2JZ HEL S15 throughout practice and qualifying. 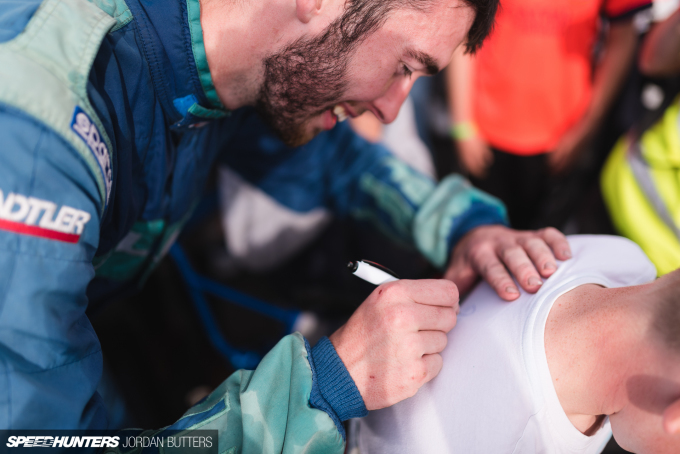 Paul’s a regular on the Irish scene and I’d love to see him compete in some more European events. The weather in Ireland is something else. Heavy rain follows blazing sun, then howling wind and more rain. I’m deliberately avoiding a leprechaun/pot of gold joke/rainbow joke here. Instead, let’s talk about how Jack Shanahan would be piloting his 13-year-old brother Conor’s 180SX for Global Warfare. 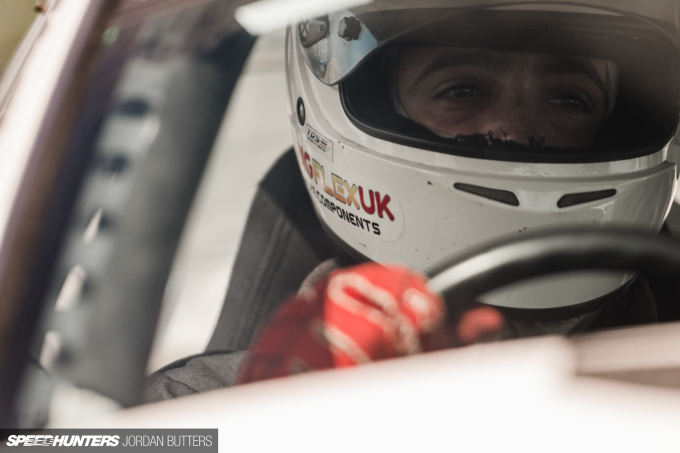 Jack’s looked entirely at home in this car all year, whilst his own BMW-powered S14 has given him constant troubles. I wonder how it must feel to be looked up at and admired at just 16 years of age? Whilst most 16-year-olds hone their drifting skills in front of a games console and TV screen, Jack mixes it up with the best in Europe and signs autographs for his fans. Crazy. Keep your sunshine – I love shooting in changeable weather, and the scattered storm clouds overhead presented small pockets of light that flared up the smoke hanging in the air. 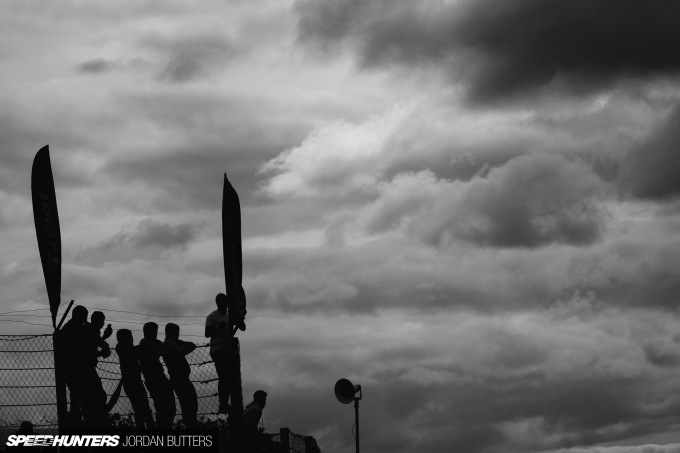 Down on the track, a storm was brewing too, as it looked increasingly likely that the Irish winning streak was about to come to an end. 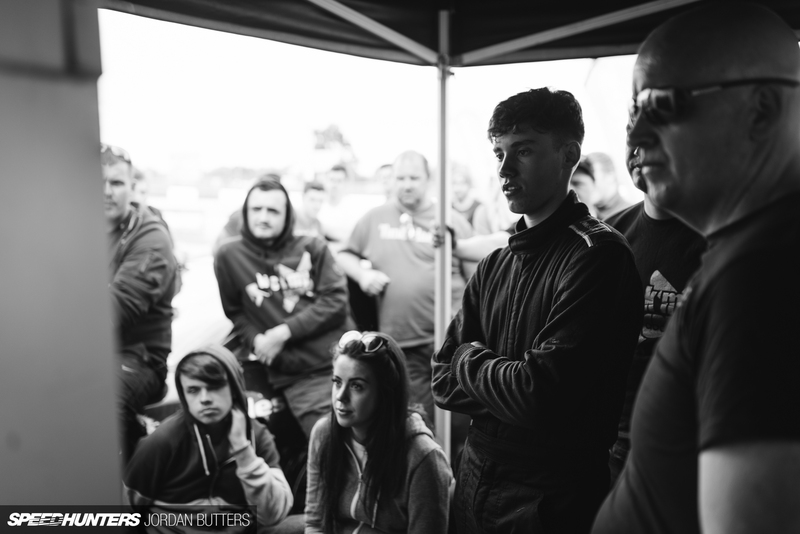 Pegged as a possible winner at Global Warfare, 16-year-old Tomas Kiely was relegated to watching the IDC livestream from the pit lane after an early exit in the Top 16 to classmate Shanahan. Rather than structure the bracket so that an Irish driver was guaranteed to meet a Drift Allstars driver in the finals, the event was run according to qualifying order. 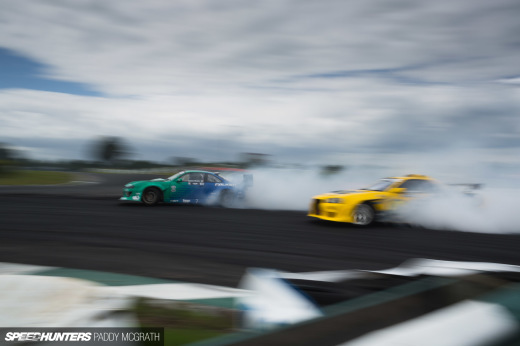 This meant that both IDC and DA drivers would knock fellow teammates out in the run up to the finals. There was an air of confidence about the Irish going into Global Warfare III, despite the obvious challenges that they faced. 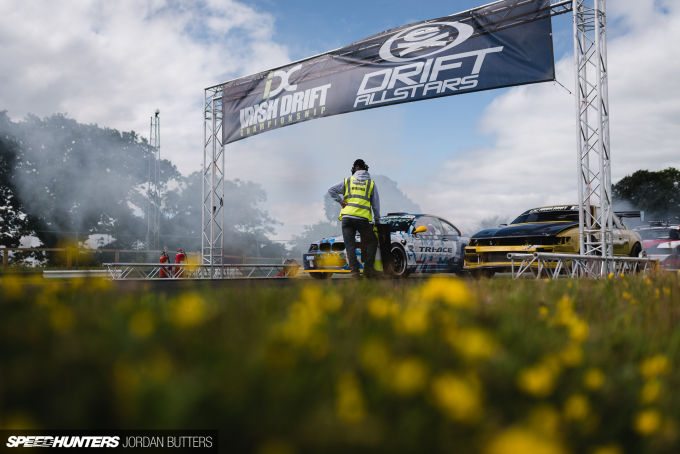 However, come the day of the event you could see the realisation dawning that Drift Allstars presented a very real threat. I think the driving, the cars and the level of preparation took the locals by surprise. 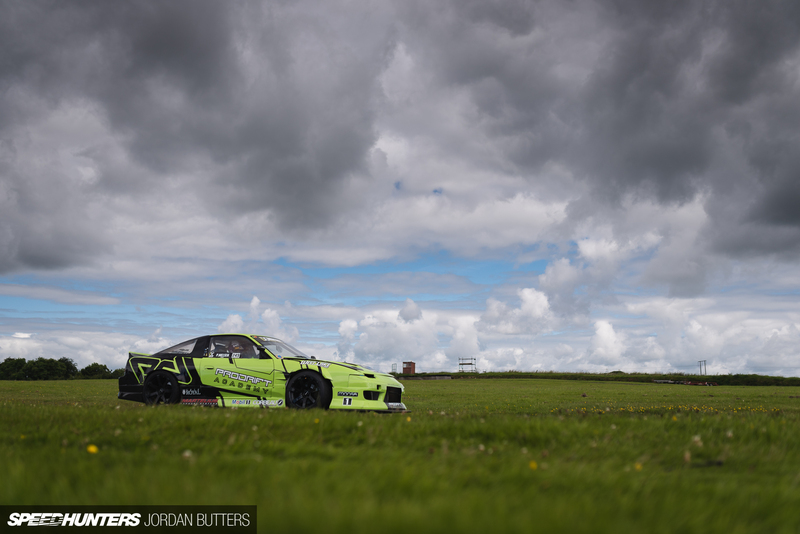 Dany Neville wasn’t able to bring his ex-Gittin Jr. Mustang over from Dubai, so flew in a freshly-built Rocket Bunny Boss-kitted S14 with an LS engine instead. 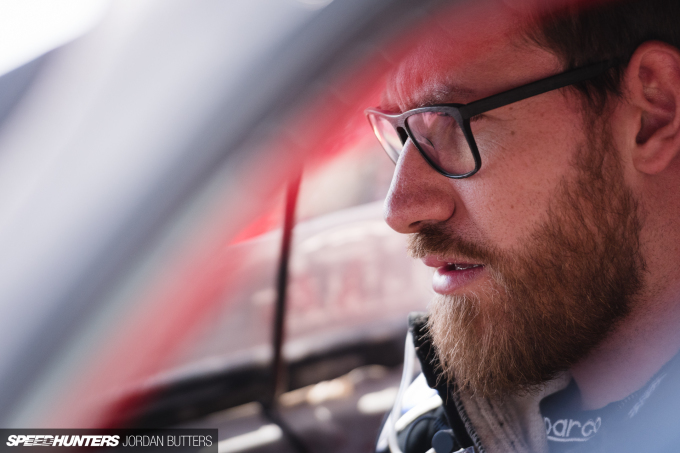 The car was plagued by mechanical issues, and unfortunately Neville was only able to complete a handful of runs before failing to qualify. 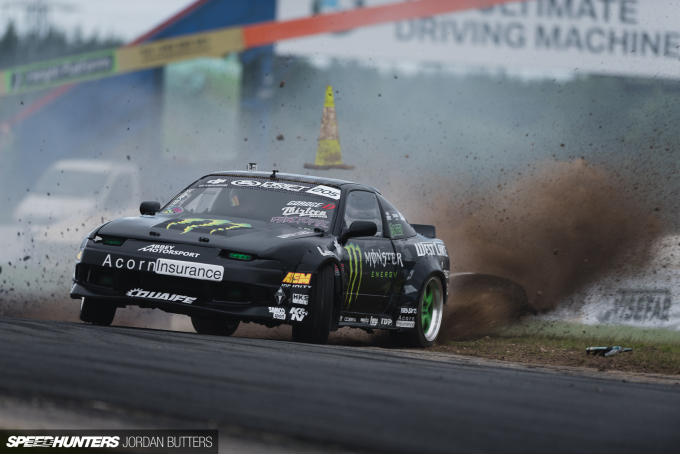 You might remember that Paddy didn’t have him down as a contender, but FredOx took some notable scalps for Drift Allstars at Global Warfare, and his Soarer took a bruising in the process. 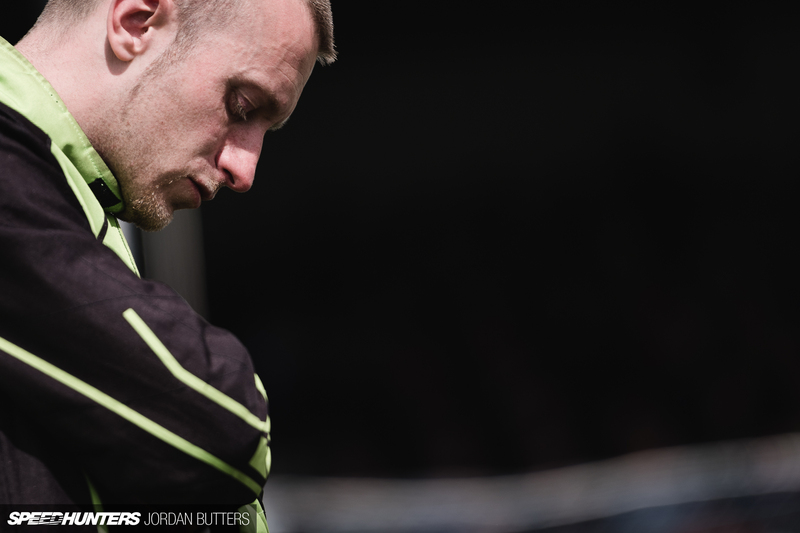 He dispatched both Polish champion Piotr Wieçek and former British champion, Ireland’s Shane O’Sullivan. 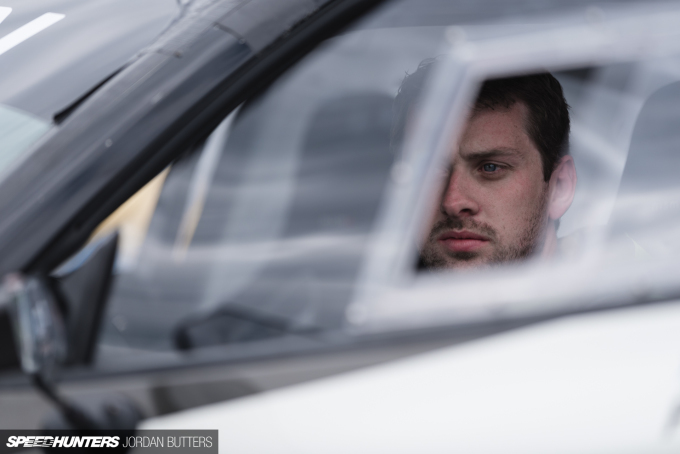 A pensive Steve ‘Baggsy’ Biagioni pays attention during drivers’ briefing. Steve’s year so far has been of mixed fortunes, however he’d just returned from demoing at the Goodwood Festival of Speed, so seemed on good form. 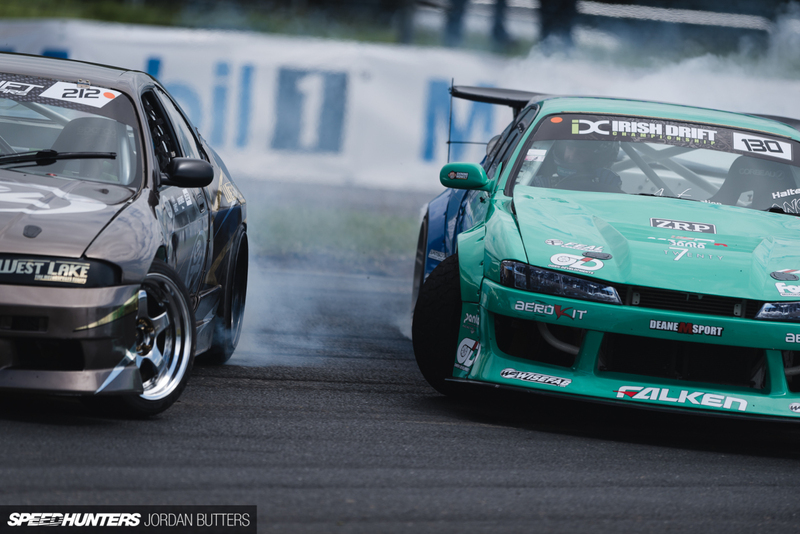 Prodrift Academy driver Mike Fitz recently switched from rotary power to a 2JZ set up in his FC3S. 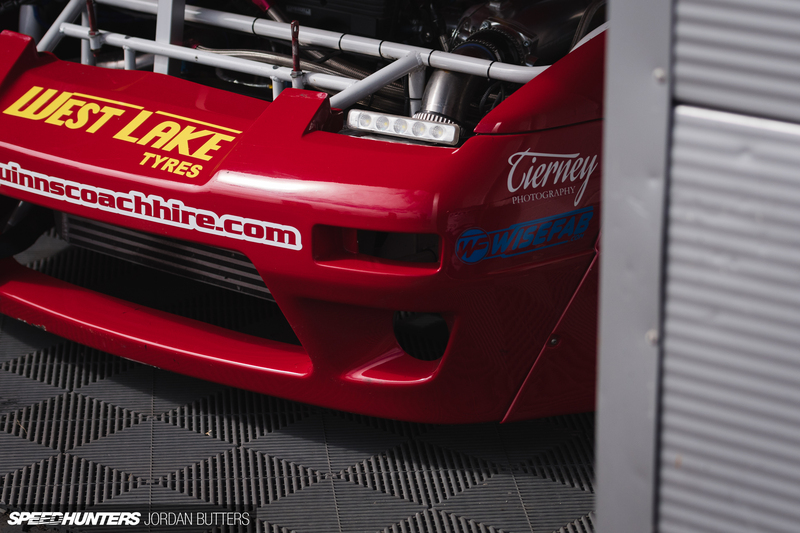 I wasn’t sure how to feel about this, as I’m a big fan of rotary engines, or more specifically the noise! However, after seeing Mike battle his way through the rankings to end up in the semi finals, it was clear that he’d made the right decision. 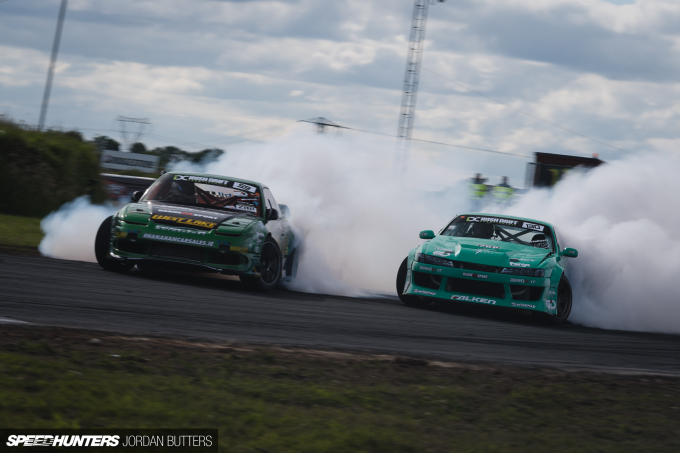 James Deane and Janis Eglite have battled numerous times since I’ve been following the Drift Allstars series around Europe. 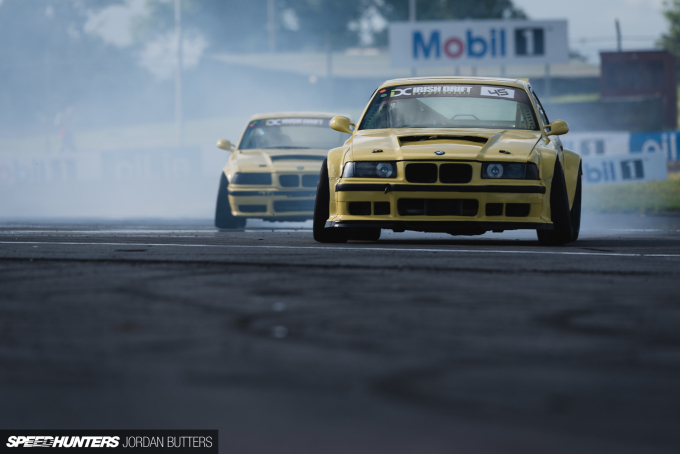 Their driving styles are very well matched, so tandem battles are usually fought tooth and nail. Janis’s car sounded like it was misfiring slightly, but he battled on regardless. 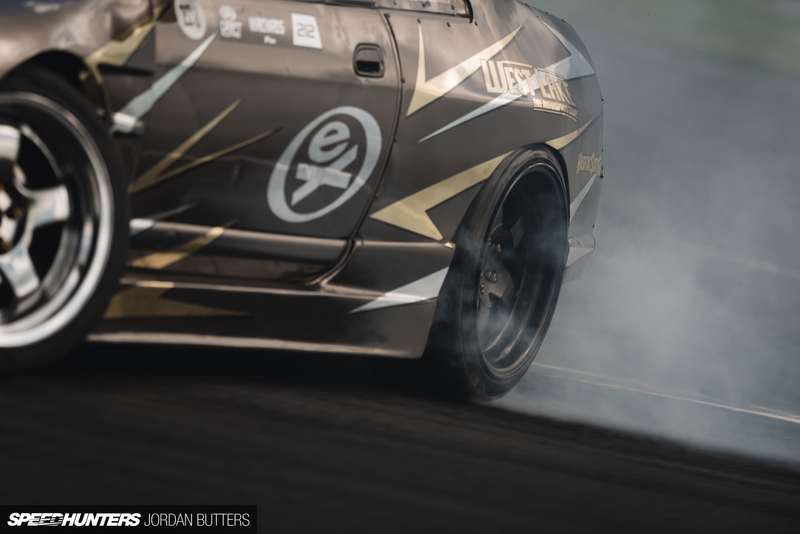 With drifting in Europe not yet attracting big prize purses or high-level sponsorship, it’s crazy to think what these guys put on the line in the name of pursuing what they love. 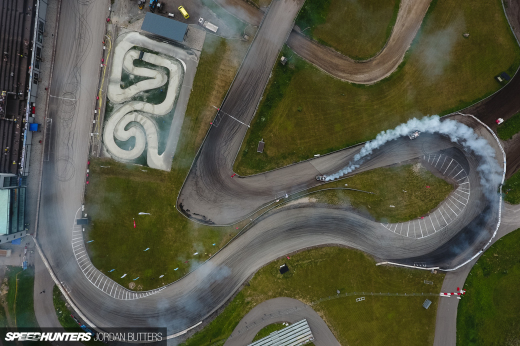 Pushing towards the third clipping point saw the drivers trying to scrub off huge speed as their cars flew towards the grass (and armco) before switching back the other way for clip four. 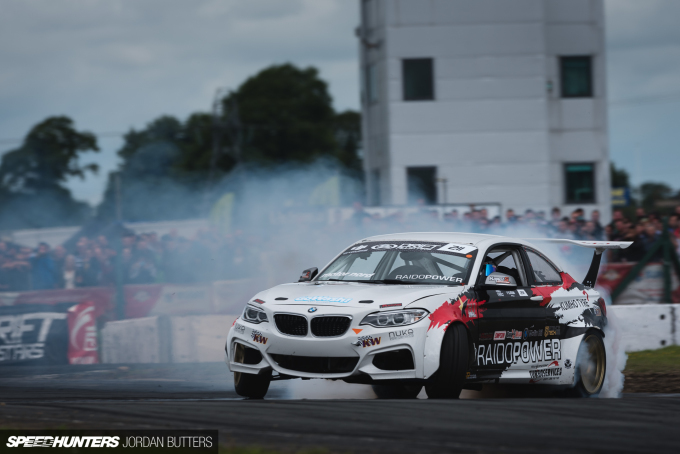 Baggsy won the first round of Drift Allstars in Yas Marina, and looked strong in practice at Mondello, but mechanical issues saw him fail to qualify for the second event in a row. After I shot this image of Tomas Kiely and Jack Shanahan rounding the first turn at Mondello I realised that I’m older than both of them combined. Ouch. 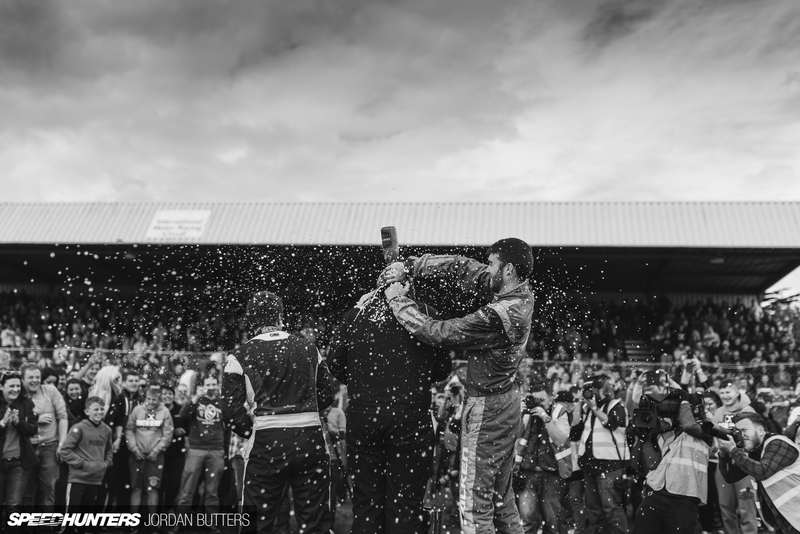 I’ve said it before and I’ll say it again – I find photographing the people involved in motorsport 100 per cent more enjoyable than shooting the cars or the action on track. 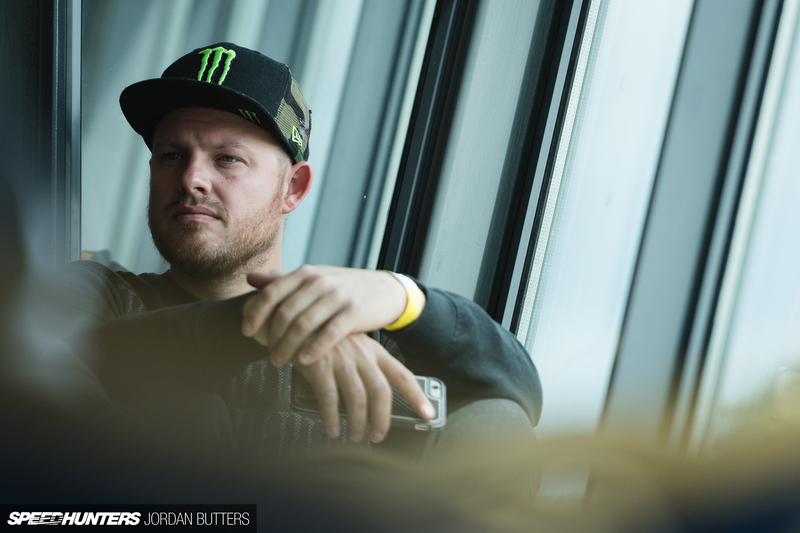 There’s so much riding on success for the guys and girls involved that the importance of what’s about to go down is often written on their faces for all to see. 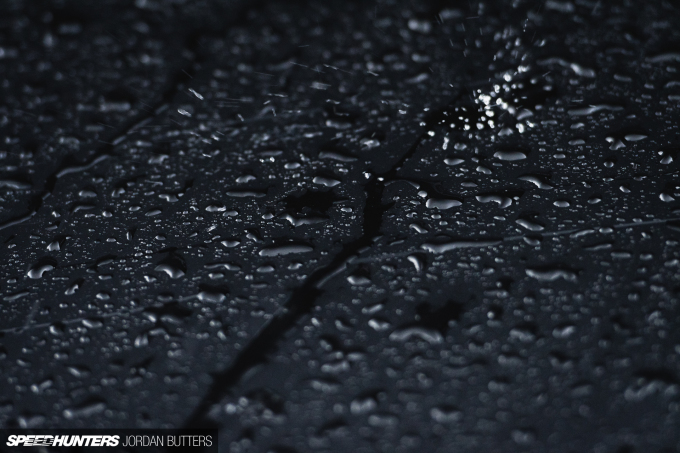 To me, photography should be about telling a story and conveying emotion. During a break before the Top 16, Formula D star Darren McNamara took to track in the Guinness World Record-breaking 1,361bhp Nissan Nismo GT-R. The car was flown in for the event from the Middle East after setting the record for the fastest vehicle drift at 304.96km/h! 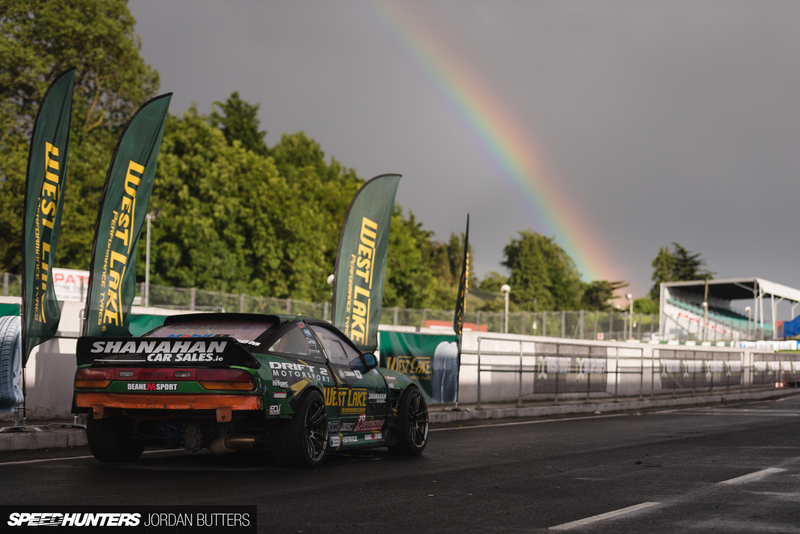 Mondello Park is a bit small for it to properly stretch its legs, but then again, so is every circuit on the planet pretty much. Considering our relative geographical proximity, I don’t actually often get to shoot alongside Paddy – probably once a year or so, so it was good to visit his home series. He was kind enough to pick me up from the port in Dublin and give me a grand tour of Ireland’s best traffic jams in Project GTI too. It was around the time that I took this photo that ‘drift event fatigue’ was setting in for him I think. Or it could’ve been overly-angry Irishman syndrome; or possibly he was slightly worried about the Irish unbeaten record? Student vs teacher. 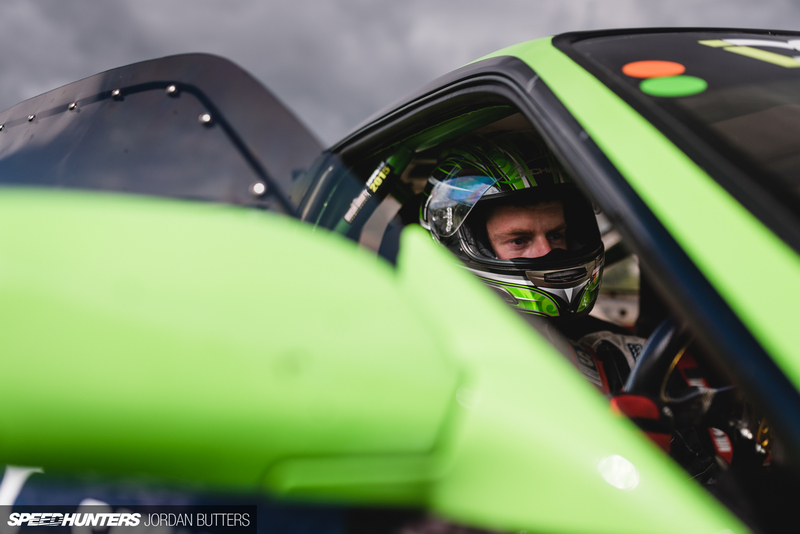 James Deane has mentored Jack Shanahan in the art of driving sideways from a young age, but there are still clear differences in their driving styles. 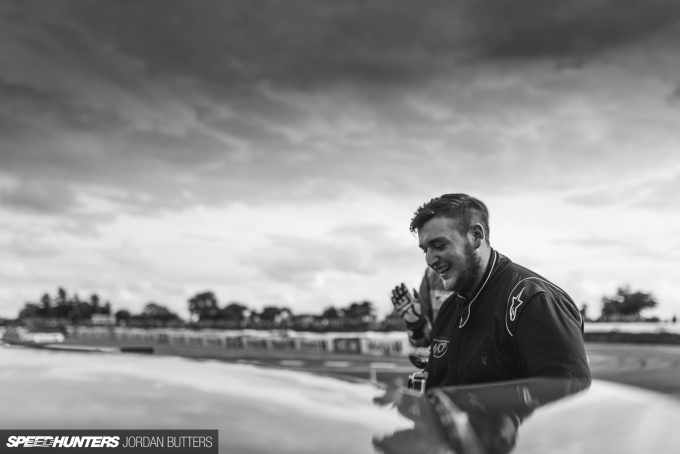 James is much more relaxed and smooth, almost more mature behind the wheel, whilst Jack is very fast and aggressive. You really get the impression that he’s on the ragged edge of control. 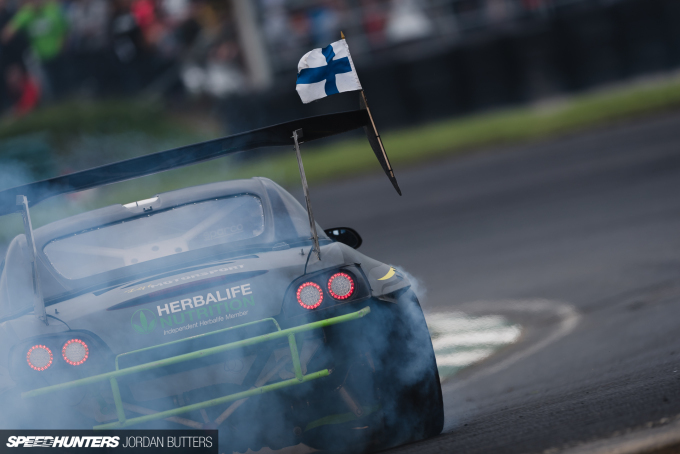 Global Warfare was a truly global affair this year; drivers flying the flag for Finland, Sweden, Norway, Germany, Latvia, Lithuania, the Netherlands, the United Kingdom, Australia, South Africa, the UAE and, of course, Ireland all took part. 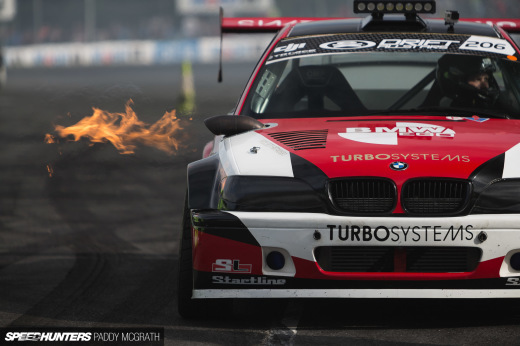 Fredrik Sjodin’s BMW 2 Series is possibly my new favourite car on the grid. 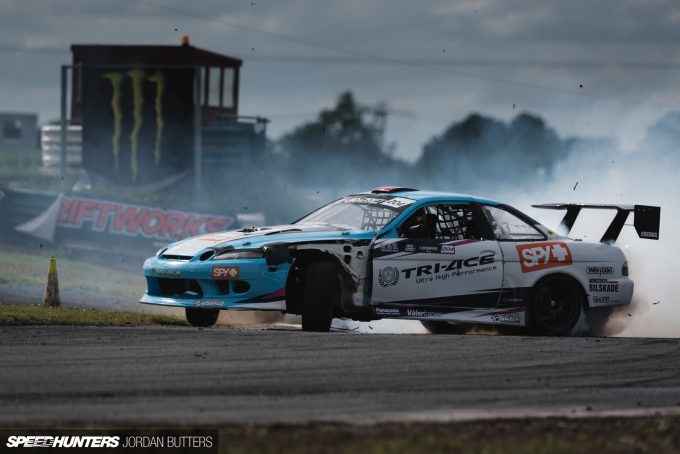 I saw Fredrik suffer a big crash last year in Estonia which wrote off his S14, so I was surprised to see him pushing as hard as he was at Mondello in a brand new chassis. 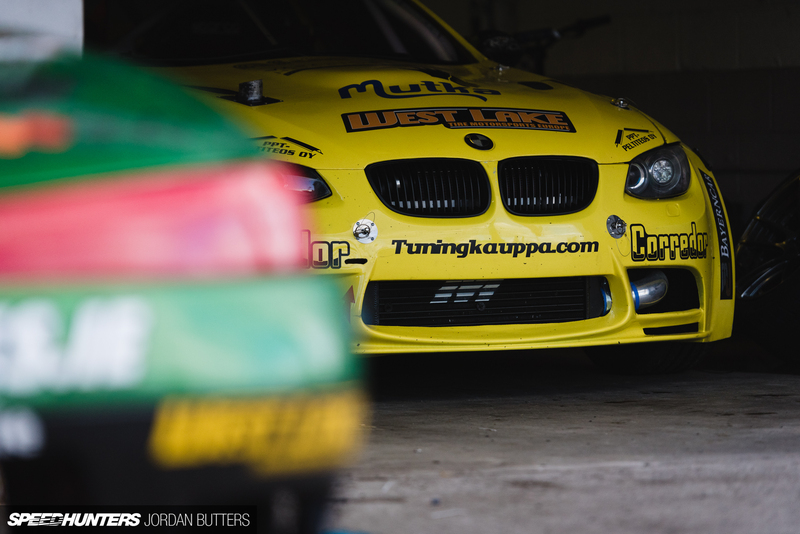 When I say new, I mean brand new – this car only left the BMW factory in January! I almost gave up on snagging this shot, but I’m glad I persisted. 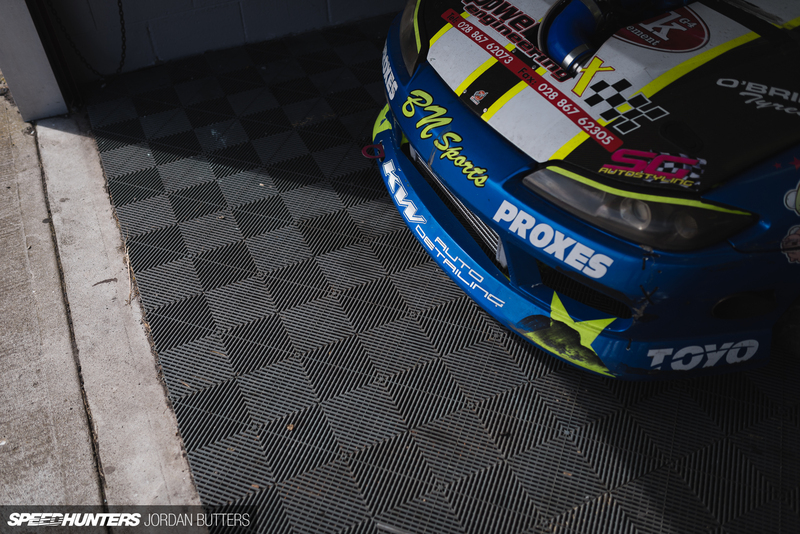 After waiting for almost half an hour during practice to catch someone clipping the wall I managed to capture Sean Galvin tagging the rear end of his S14 during qualifying. Shooting a competition event is often an exercise in time management. As I work for the Drift Allstars series as well as a handful of drivers, I have to try and get a good variety of shots to meet every brief, and that involves more than just standing on the same corner waiting for the cars to pass. 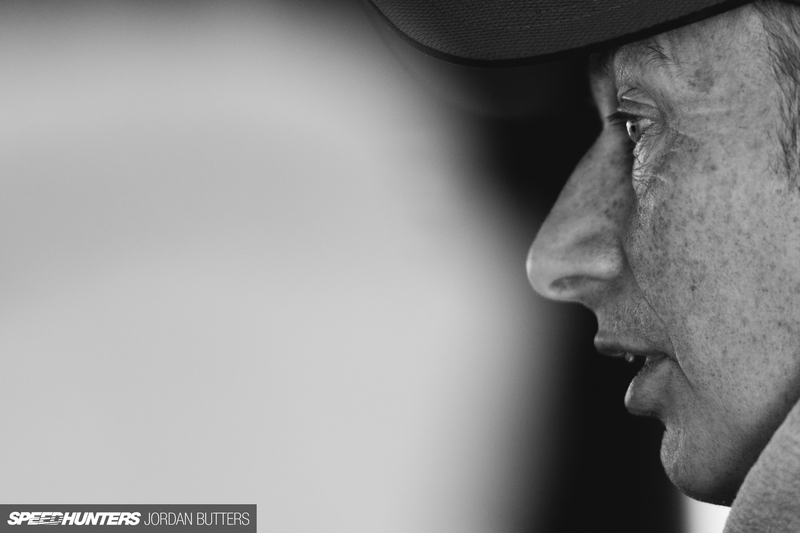 When possible, I always try and make it down to the start line – you get to see the drivers as they approach staging and get themselves into the right mindset. This is obviously the perfect time to shove my lens into their cars. 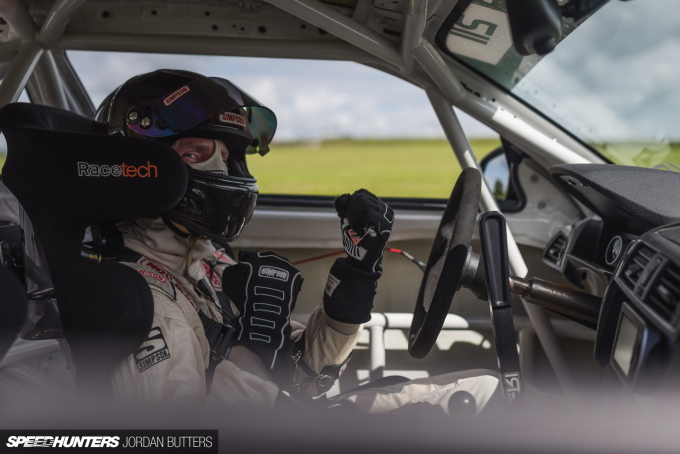 Some of the time you can go unnoticed as the driver mentally prepares for battle, but others are a little more relaxed and have a bit of fun for the camera. 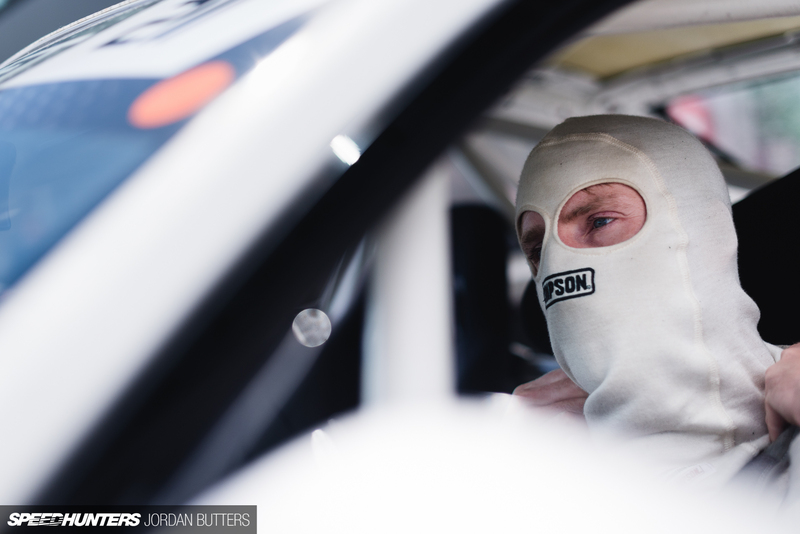 Here, Fredrik Sjodin is ready for a fight in the start line queue – hopefully not with me. Mr. Keep Drifting Serious, Peden Nielsen, was driving the Prodrift Academy 180SX for the weekend. 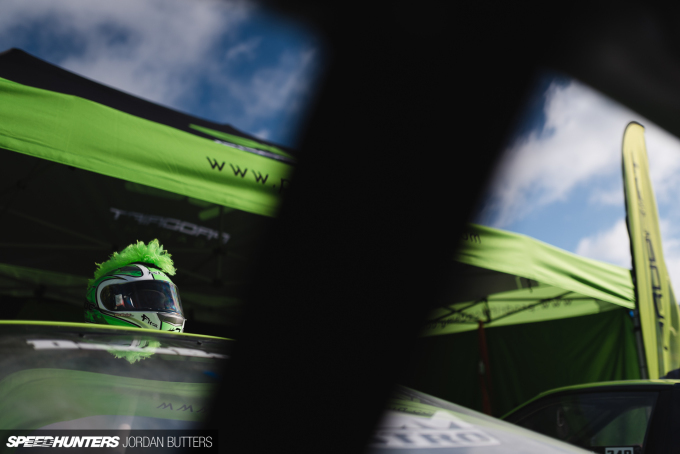 Peden is a huge character in the IDC paddock, but all business out on track. 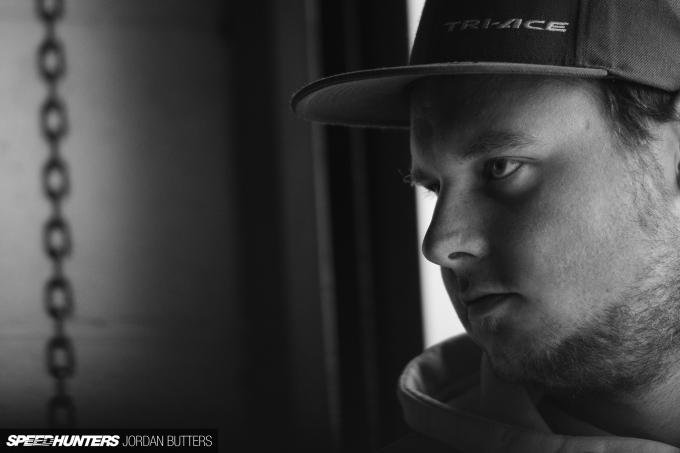 Originally from Denmark, he’s lived in Ireland for longer than he lived outside of Ireland, so the IDC rightfully claimed him for their team for Global Warfare. Look closely and you’ll see that Piotr Wieçek is completely missing a rear tyre after debeading just before clip three. 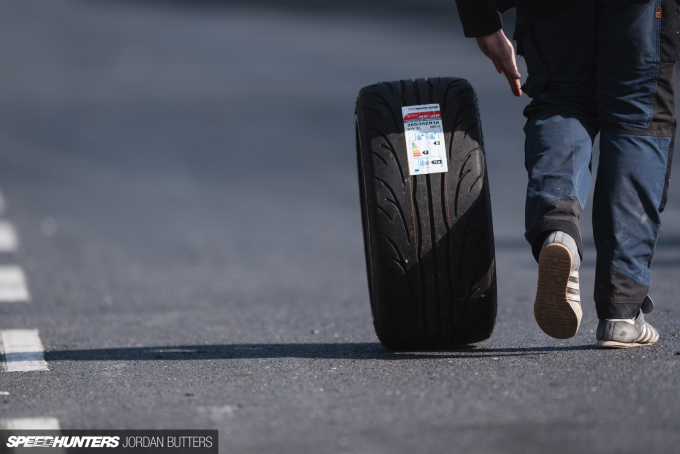 Impressively, Wieçek went on to complete the run on three tyres, netting him 7th place in qualifying. 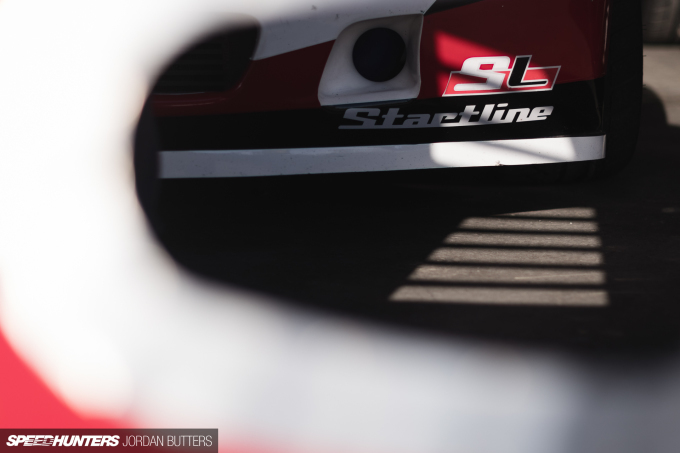 I used to own an FC3S street car, so I’ve got an obvious soft spot for Mike Fitz’s Mazda, captured here during a brief moment of sunshine. 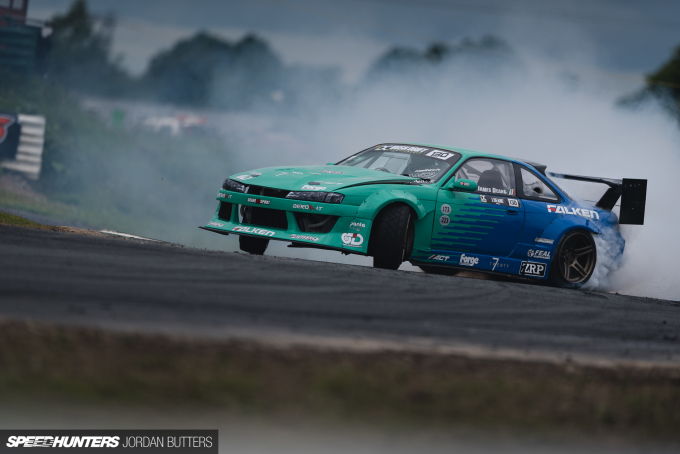 British driver Martin Richards is no stranger to Drift Allstars nor IDC, being one of the few in the roster to have competed in both championships. 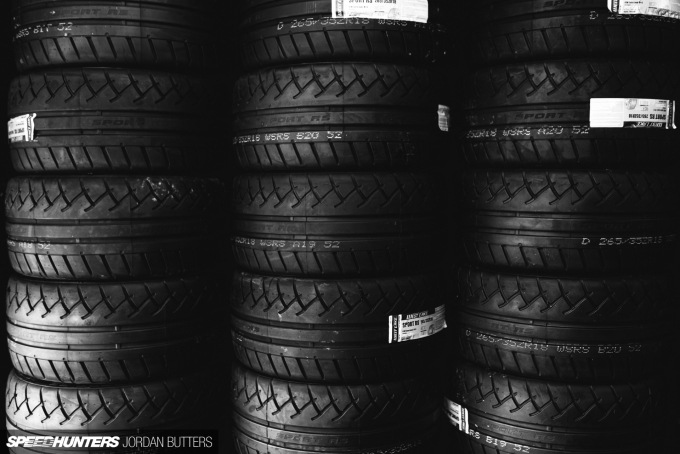 He was also one of the many, many drivers running on West Lake tyres over the weekend. I’d not heard of the brand much before last season, but I’m guessing they perform well and are keenly enough priced to have attracted a lot of attention. 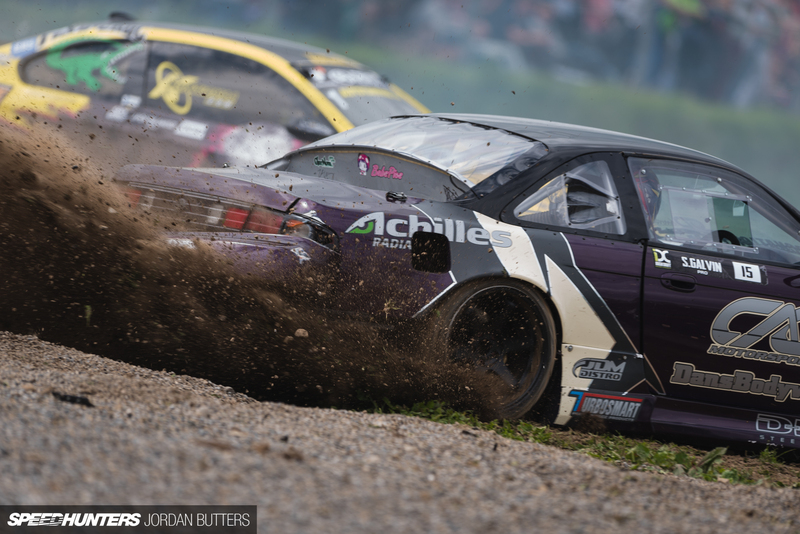 German Marcel Uhlig joined the Drift Allstars roster late last season with his lightweight carbon R33. 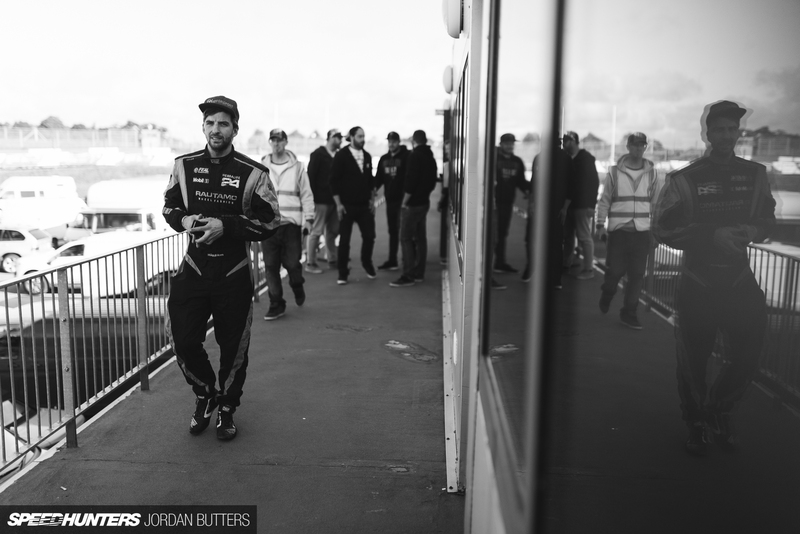 Sadly he was one of the few visiting drivers who failed to qualify for the Top 32. 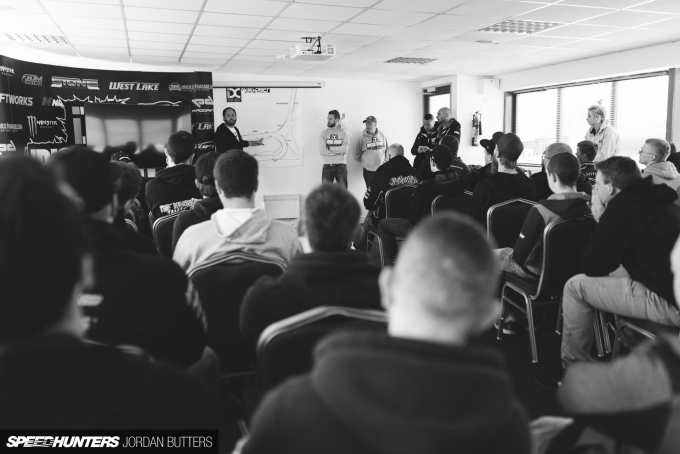 Drivers briefing complete, the competitors head for their cars to prepare for the Top 32. As they passed me by their faces showed a mixture of anticipation, nerves and excitement. 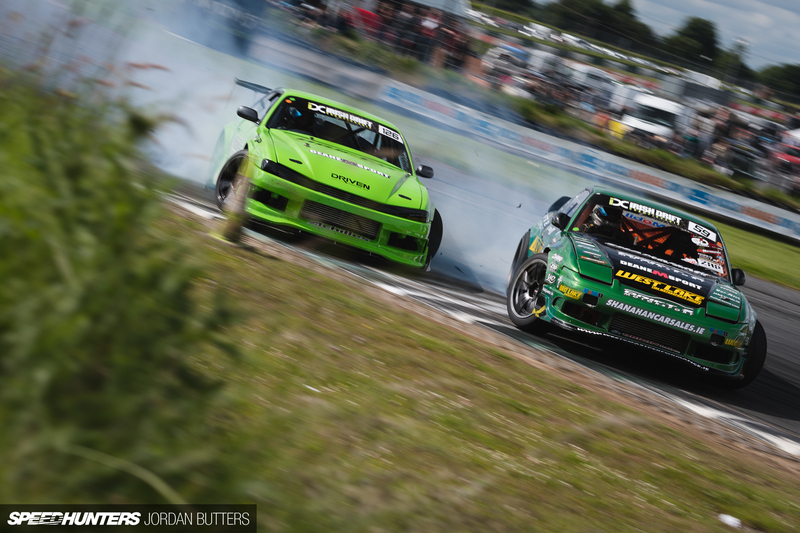 While his team mate, Peden, does his best to keep drifting serious, Mike Fitz isn’t exactly on message. His race helmet is the only one I’ve ever seen with a mohawk attached to it. 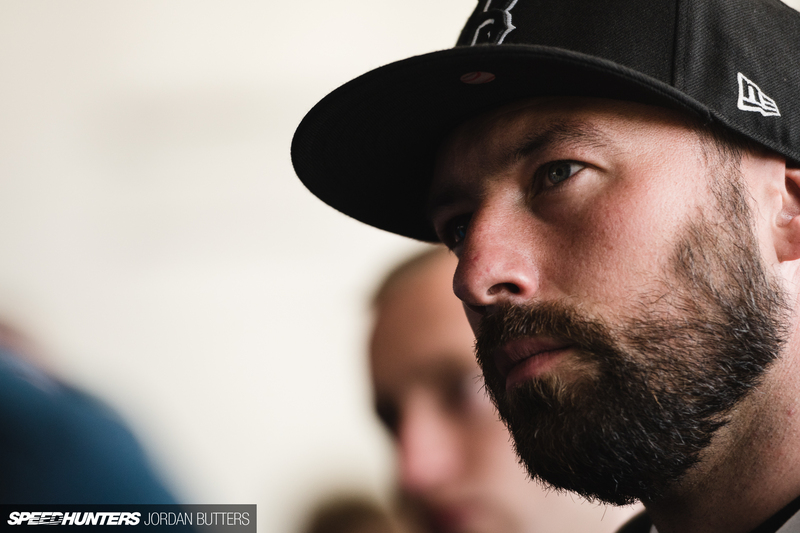 In our preview post, Paddy predicted that Dennis would either win or end up in the grandstand. He didn’t win sadly, but he didn’t do the latter either. Although he gave both a good go! 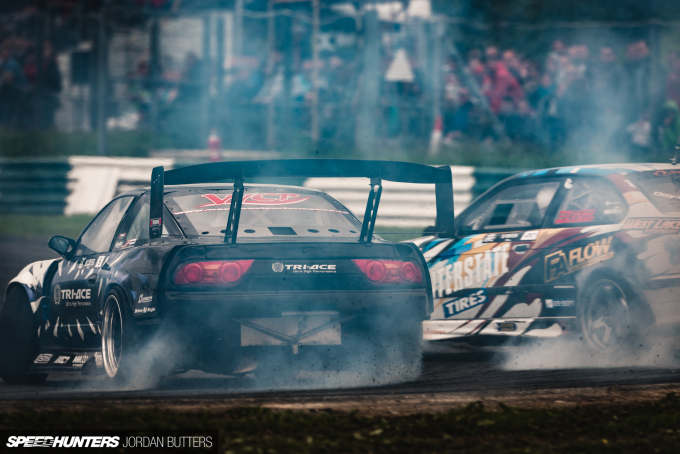 A battered FredOx chases down, and ultimately beats Shane O-Sullivan. Despite shooting drifting for almost 10 years, it still amazes me how much control these drivers have in such close proximity to one another. 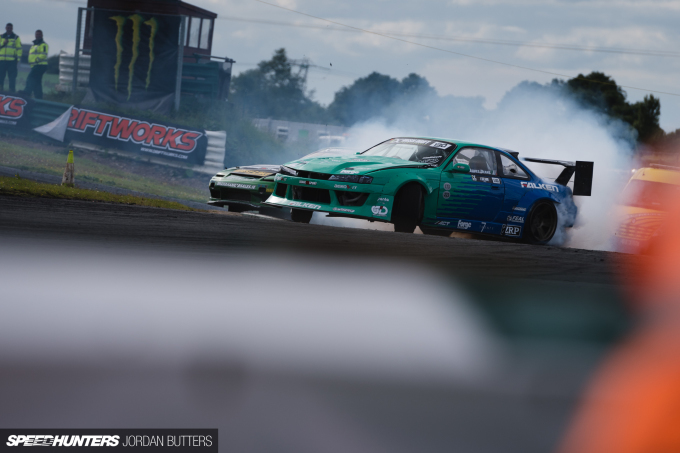 After years of campaigning an SR20 in his S13, Monster Energy athlete Baggsy finally made the switch to an LS3, and despite some bad luck, it seems to be working well. This thing sounds incredibly loud and raw in person. 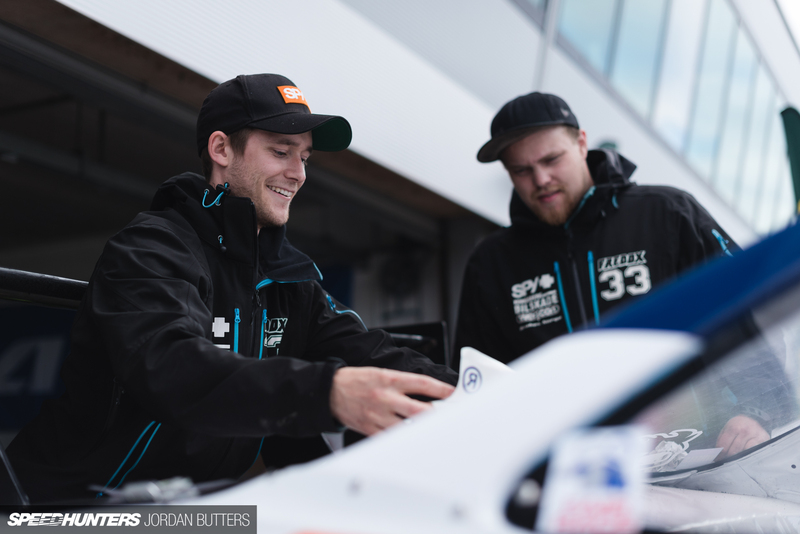 Latvian champion Janis Eglite looked to be having issues adjusting to the wet circuit at Mondello park during Saturday, but soon found his form. He qualified 9th and made it as far as the Great 8. 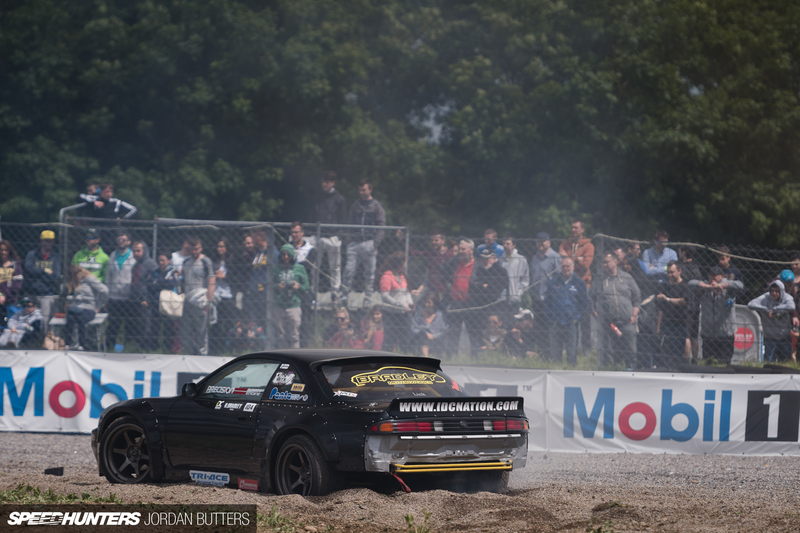 Ireland’s Nigel Colfer campaigns in Drift Allstars but was representing the Irish at Global Warfare. I think we should’ve at least flipped a coin for which side could claim him and James Deane? Either way, his Tri-Ace Tyre 180SX got a complete seven-day makeover after returning from the Middle East last week – it looks awesome! Let’s play a game of Where’s Paddy? 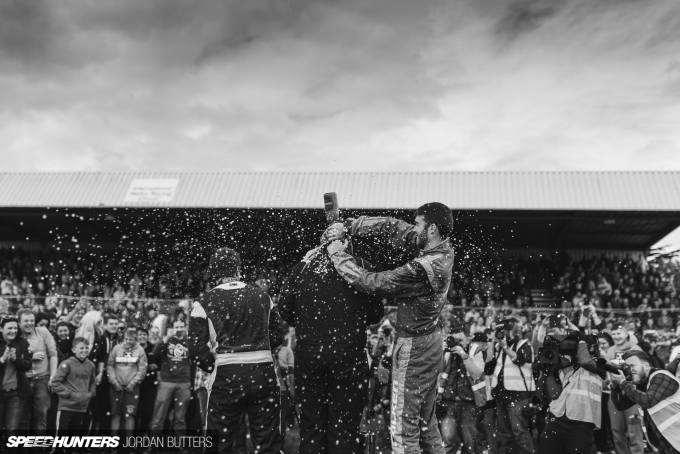 I almost always shoot podiums from the front, but as the crowd invaded the track I quickly realised I was never going to make it through to a good position in time. 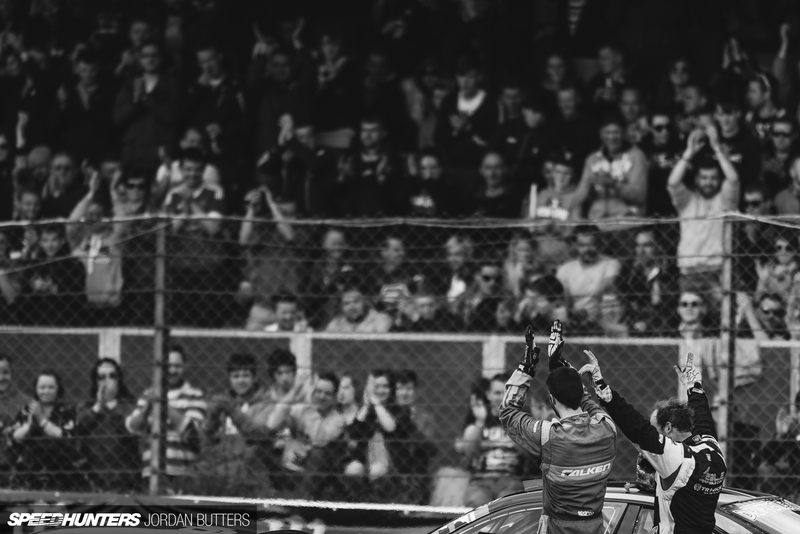 Still, I really like this shot of the celebrations. Mr. McGrath will be along soon to share his experiences of Global Warfare, as well as what went down, and ultimately, who won. Awesome! THIS is why I come to this website. I Can't wait for M. McGrath's pictures! mikum You're too kind, thanks for taking the time to read through. Louch Glad you liked it. I sense Paddy McGrath's coverage will contain zero smugness or gloating. Nope. None at all. 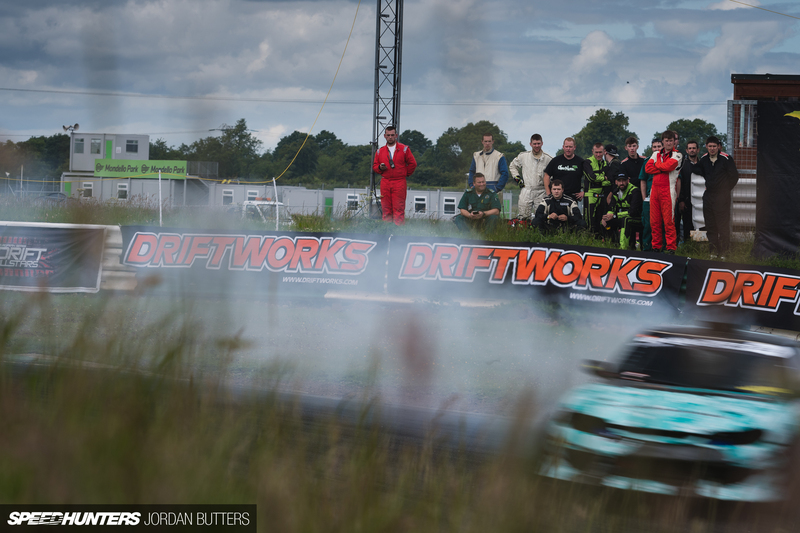 Best drift event I've ever gone to. Serious driving all day and everyone wanted a spot on the podium. So happy I got to experience it in person.